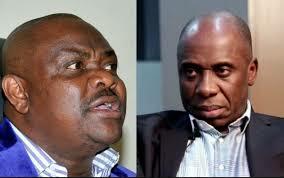 The Rivers State Governor, Nyesom Wike has alleged that his predecessor and current Minister of Transportation, Rotimi Amaechi was behind what he termed “evil machinations” to destroy the Chief Justice of Nigeria (CJN), Justice Walter Onoghen. “If Buhari has any integrity , he should investigate the killing of the Resident Electoral Commissioner in Kano alongside his family during the 2015 General elections. Buhari must ask what killed the REC and his family while Ibrahim Idris was a commissioner of police”.